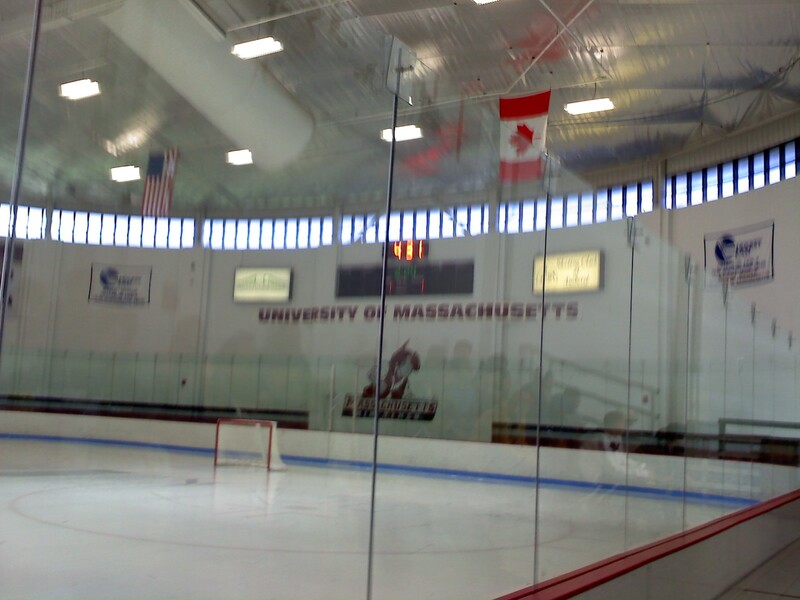 Well, your UMass Minutemen lost their preseason game to UNB for the second time in as many years (this time 4-3 in OT). While we could pout about losing to a CIS team, in truth there were quite a few positives to take out of this game and at least one of the major downsides of this game should not affect the team too much this season. ~Your humble blogger actually bothered to take a notebook to this game and form coherent thoughts about it. Savor these game notes, because he will probably not be sober or emotionally detached enough to form rational thoughts during the game again. ~Danny Hobbs played well, his goal in the first period was one of the prettiest you will ever see. Hobbs had the puck at center ice a flipped a clever back pass to Power, who was charging up the side boards. Power threaded a beautiful return pass to Hobbs in the slot, who then delayed until the UNB goalie committed and moved the puck to his backhand for the goal. Hobbs also scored the third Minuteman goal on the powerplay in the 3rd Period. Marcou slid the puck across the blue line, and Hobbs took a hard low slapper from the right point. The puck had the slightest of deflections off of a UNB defenseman in front of the net and found the bottom left corner of the net. It would be nice to see Hobbs continuing this trend in the regular season, especially considering that he was a highly regarded recruit who has not really panned out (4G/7A/13Pts/-6 in 57 Games). ~Paul Dainton. He looked strong; he gave up only one of UNB’s four goals in two periods of work, and the sunlight coming through the practice rink’s windows could have had something to do with that one. He made a fantastic glove save in the first period, extending the glove just above his pad to snag a hard shot out of the air that appeared to be netward bound. In classic Dainton fashion, he played the puck a lot and kept us on the edge of our seats, but it didn’t cost him, and he played a very strong game overall. ~Rushing the puck instead of dumping it in. I know that we’re a speed team and, as such, Toot has thought it wise to dump the puck instead of carrying it into the zone a lot. Despite this logic, the dump and chase hasn’t seemed to work too well over the last couple years whereas creating plays off the rush has worked well when we have done it. I was pleased to see Toot allowing the guys to carry the puck in more and dump it in less today. ~The aggressive 2 man forecheck. I LOVE THE AGGRESSIVE FORECHECK. UMass forwards created havoc in the UNB zone when they used it, and it was very effective, especially in the first and third periods. I feel like they took their collective foot off the throat in the second and used the 2 man forecheck less, but when they used it, it was super effective. ~The Langeraap-Czepiel-Sheary Line. Okay, what can I say about a 5’9” center from Holyoke who had one goal last year? You take him and pair him with a freshman winger who is also just 5’9”. And then you match them both with a 6’2” 202lb. senior winger who has been injury prone, but still looks like he could kill you with just a look. Well, you’d probably say you’ve got a finessey fourth line with one big guy to protect it. You’d be wrong. This line played scrappy, hard-nosed hockey all day long. Czepiel and Sheary were constantly creating havoc for UNB and coming up with great takeaways in New Brunswick’s zone. Sheary also had a nice deflection on a Colin Shea shot that was saved, unfortunately. Langeraap looks like he’s in good form, as well, and he didn’t mind showing a little physicality in the game. In fact, this line started the game (much to my annoyance, at the time). My apologies to these guys, they played their hearts out in an exhibition game and I’ve gotta say my hat’s off to them and I hope they play this way in the regular season, because if they do they will be a fantastic energy line. ~The powerplay while inside the offensive zone. I really liked the down low cycling and looking for the man in front of the net. This was combined with a few point shots to keep the PK honest. Although the powerplay goals that our boys did score was a point slapper and a scrum in front of the net, I feel like most of our powerplay production this year will come from that down low cycling game, if it remains strong. ~The breakout on the powerplay. While the breakout stalled a little in the second period, the Minutemen were mostly able to gain entry all night. Except when on the powerplay. I don’t know why, but whenever we went up a man we seemed to have issues gaining the blue line. Compounding this were some shots on the rush when we did gain the line that were rushed and from bad angles. The set plays once in the zone seemed to be working really well, so why take a bad angle wrister when you could probably set up something better? ~The penalty kill. The PK let UNB have A LOT of time in the offensive zone with the man advantage. Let Maine have that much time, and I guarantee they score. ~Line changes. They were lazy and sloppy. I’m willing to chalk it up to being the first game and only preseason, but they need to be much more crisp when the regular season rolls around. ~Defensive positioning. Especially in the third period and the overtime, our D-men looked to pressure the puck on the strong side and frequently overextended themselves. (Noteworthy exception: Doug Kublin. He looked as solid defensively as ever and denied a couple opportunities with good positioning and stickwork. Fundamentals, kids. Fundamentals.) This allowed UNB to get many wide open shots that our freshman netminder couldn’t stop. ~Jeff Teglia. God, I’m sorry, he was awful. It was tough to watch. The kid definitely has potential though. One can clearly see he’s very athletic and made a couple acrobatic saves. Unfortunately, he seems to have some issues seeing through screens and controlling rebounds. He also is way too slow to close the five-hole when he goes into the butterfly. The lateral quickness was his biggest issue, though, as he couldn’t get post-to-post quick enough to stop a couple goals from shooters left wide open (see rant on defensive positioning above). Three goals in one period and an overtime is unacceptable. I’m very confident he will improve (and, who knows, maybe today was just first game jitters), but the question is, will he improve enough to be the No. 2 goalie for this season or will it be Kevin Moore, who didn’t play today, who gets the nod? ~The ice. It was so bad. They had to stop the game and sweep it. I know it was warm out and I know the practice rink is always worse than the ice at The Bill, but seeing it today brought back memories of the second UVM game last year. I do not want to relive that. ~Mike Marcou. He did all the little things well, like positioning himself and sticking the rebounds to the end boards. His game in the defensive zone was Kublin-esque. And he rushed the puck really well. All day long. The only concern I have is that he may be too aggressive on the rush, taking the puck too deep and exposing the team to a counterattack. He didn’t get burned today, but he could in the future. Nevertheless, I suppose we shouldn’t try to change that aggressive tendency of his game so I hope it works out and he torches the opposition more times than we get burned. I mean, come on guys, we lost to UNB. But I guess I’m about as happy as I could be with that loss. And, to be honest, I’ve come out of that game with much more hope for this season than when I went into it. One way or another, it’s going to be an exciting season and I just can’t wait for it to start for real. ~Edit: Eddie Olczyk left the game early and was seen on crutches following the game, but sources indicated the injury was very minor, and he should be fine by next week. ~Edit Pt. 2: Darren Rowe logged all his minutes playing on the wing, which was something we had heard inklings of at the end of last season. It makes sense given his shiftiness and playmaking abilities when juxtaposed with his somewhat small size and lack of checking power. Great analysis. Felt like I actually watched the game, but since I didn’t, I appreciate reading about it and gives me some idea how UMASS looks. Many thanks, my man. Look for future game previews and (probably half-assed) reviews. My favorite part is where Walsh referred to Mikey’s defensive game as “Kublin-esque.” This happened.